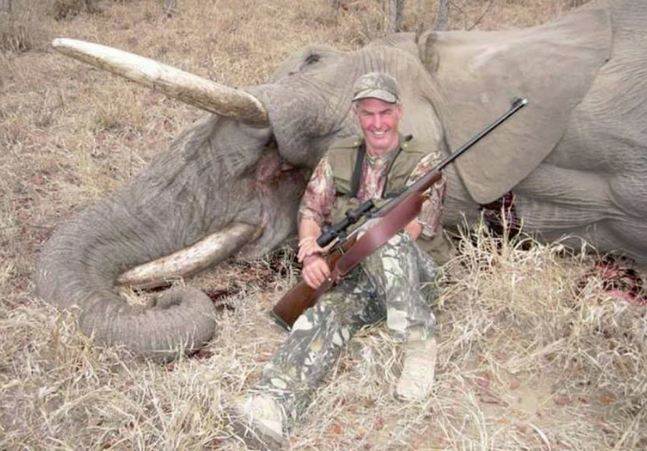 Photo Shows Interior Secretary Ryan Zinke Posing With Dead Elephant-Fiction! - Truth or Fiction? Photo Shows Interior Secretary Ryan Zinke Posing With Dead Elephant-Fiction! A photo shows Secretary of the Department of Interior Ryan Zinke posing with a dead African elephant. A photo of a big game hunter posing beside a dead elephant does not show Interior Secretary Ryan Zinke. A photo of a Scottish farmer posing beside a dead elephant has been falsely identified as Interior Secretary Ryan Zinke. The photo first appeared at a Facebook community page called Cecil the Lion. The post states that Zinke, “appointed by Donald Trump as the most powerful person in the country” in terms of wildlife management “supports and promotes” big game hunting. However, Ryan Zinke was quick to set the record straight. He tweeted: “The only thing I’ve hunted in Africa is terrorists” on November 21. Despite the secretary’s tweet, however, rumors that Zinke posed beside a dead elephant persisted. In reality, the man pictured beside the dead elephant is a Scottish farmer named Ian Evans in 2016. A family dispute apparently led Evans’ estranged daughter-in-law to post photos of him beside big game during a trip he took to South Africa. Elizabeth Warren Claimed Native American Heritage to Land Harvard Teaching Job-Disputed!